This morning I stopped by TODAY to share a few great ideas to keep your kids busy and creative this long weekend. First, lay down a tarp to protect your floor. Then lay down some butcher paper and tape it to the tarp so it doesn't move around. 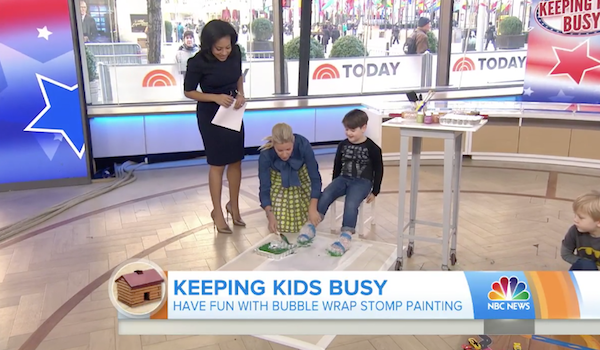 Bubble wrap your kiddos' feet, get some paint on there, and let them create a masterpiece! I recommend using washable paint. This new product from Hot Wheels is awesome. No more tripping over tracks in your living room. 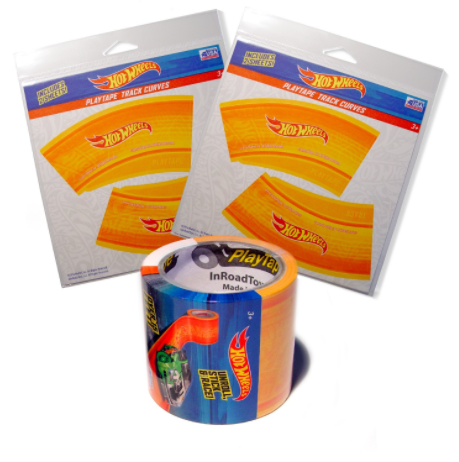 They can use this tape to create their own car tracks all over the house! And, easy clean up! Use an empty milk carton as the base for your cabins. Using peanut butter and pretzel sticks, decorate the outside to look like a log cabin. Pair with a lesson on President Lincoln, and you've got a craft time that is educational and also a snack! Use your kitchen chairs and some string to create an obstacle course for your kids. Include some flash cards to make it a math game, and they'll be learning as they pretend to be secret agents. Just in case the video above isn't working for you, you can check out the full segment here.